Trying to step my propane game up. 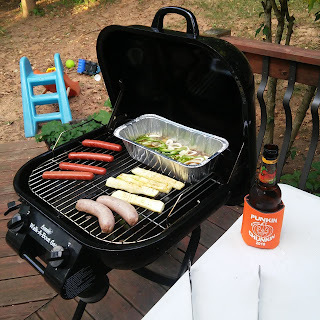 The American Tailgaters Association declared September National Tailgating Month, but October is when I'm preparing to get things cooking, figuratively and literally. Late October and early November feature a couple of my teams coming to North Carolina, and despite neither one giving me much to be excited about, I look forward to getting to see them live - and the festivities that surround it, of course. The Eagles come to Charlotte for a Sunday Night matchup with the Panthers, and a few friends and I snatched up tickets to that as soon as they were available. I was inspired lately by a friend of mine's city-themed menu for Saints at Panthers last weekend, and I'm planning to do one of my own amongst a mixed crowd of Panthers and Eagles fans. It just so happens my parents will be visiting the week before; I've already asked them to bring some Delaware Valley culinary comforts down, but that doesn't mean I'm going to shy entirely away from the Carolina side of the coin either. Two weeks later, my USF Bulls come to East Carolina for a game that will likely become a biennial trip for me now that the two are conference mates. I look forward to making the trip out to Greenville for what I'm told is an excellent gameday atmosphere in Dowdy-Ficklen Stadium. I don't yet know what the complete plans for the day are yet; I know of quite a few other Bulls here in the Carolinas, and I have some friends who sport the purple as well, so I'm confident there's a good time to be had. Add to that I'm still unlocking a new lot achievement. Last summer, before heading to the DCI championships, I bought a propane grill. I tend to be #teamcharcoal, but a propane walkabout on sale made me go a route I had passively pondered before. Sometimes, it just makes a whole lot of sense to be able to just turn a grill off without having to extinguish coals. It's also doubling as my backyard grill after the move, so I'm learning my way around it so I can be a pro in the lot. If early season results are to be believed, I can't put too much trust in either of my teams on the gridiron in those matchups, but here's to having a good time regardless!